The following is an E-mail sent from Carol Robinson’s daughter. I am sad to report that Dad passed away last night. He took a turn for the worse yesterday and was brought to the hospital; Diane, Mom, Dave and I were at his side as he took his last few breaths; we just can’t imagine life without him. Mom is holding up quite well; Deb caught a late flight out of Seattle and arrived in NH this morning – it is so good to be together at this time. There will be a mass at St. Theresa Church in Rye Beach, on Friday May 7th at 10 a.m. If you can’t make it please don’t feel badly – we appreciate all your love, support and prayers! Congratulations to Betty Hill of Londonderry, NH! 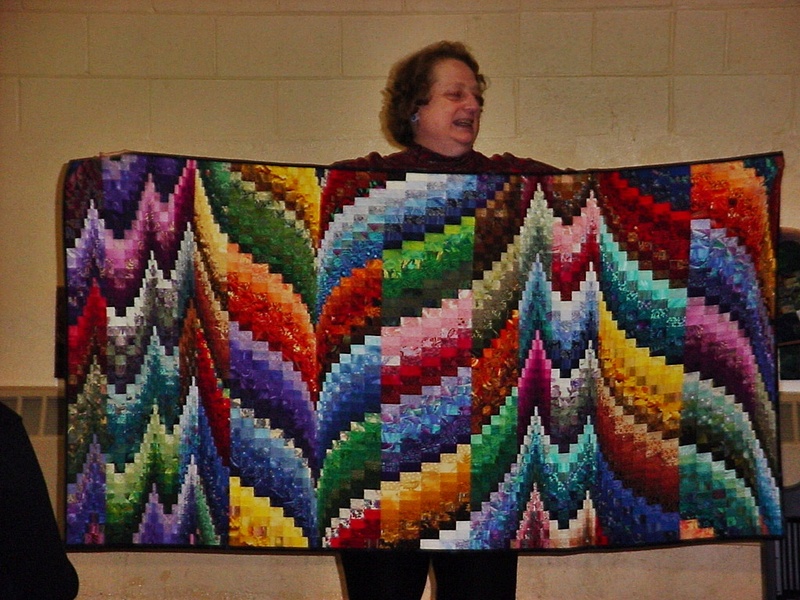 She is the winner of Orient Express, the 2009-2010 raffle quilt. This entry was posted in MVQ and tagged Quilt Show, Raffle Quilt. Last chance to get tickets for May 6th MVQ 30th Anniversary dinner will be at the quilt show. Tickets are $17 (MVQ subsidizing by $20). Stop at boutique table to buy them. Or contact Gail Wozniak if you can’t get to the show and wish to buy a dinner ticket. 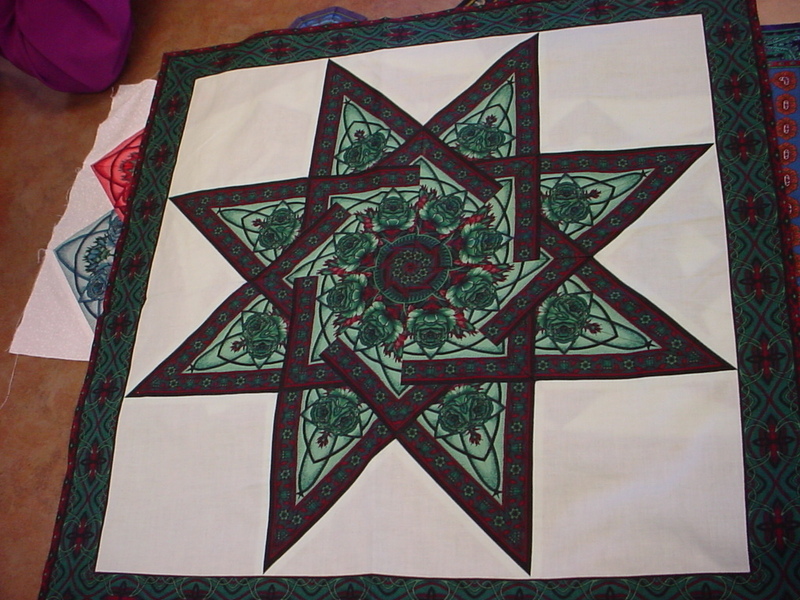 Anne Lainhart is well known for her bargello classes. After hearing her lecture on color families you can see why. She has an innate sense of color. Her color board is absolutely fabulous. It is a wonderful way to illustrate the complexities of color families. Yet at the same time make them so simple. The various ways that Anne mixes and matches her color families result in stunning quilts. She tries something just to see if it works. And for her it generally does. At least in my opinion it does. For instance, her multi-color family bargello, most quilters would have never thought to mix the colors in the way she did, but it works. Anne also works with border prints. She created a Card Trick block using fussy cut border prints. It is simply stunning! It gives you a whole new perspective on border prints. Click here for Slide Show of Anne’s Work. The workshop was to create a Kaleidoscopic purse. Anne also brought kits for ornaments and note cards. I thought it would be a fun class but I didn’t expect to learn so much. Like when not to press. I know we are taught to cut – sew – then press. But there is a point in which you want to press your kaleidoscope, that is when all 6 or 8 pieces are sewn together and not before. That way you don’t accidentally stretch any of your pieces. Who would have thought of that. Not me, that’s for sure. I got caught going ahead of the teacher and pressing my pieces. That’s me, miss smarty pants. Seems I don’t know everything after all. Anyway, Anne’s kaleidoscopes are not your average stack and wack. You need to make sure your print has symmetry to it. She demonstrated a few tricks on cutting your border prints using that symmetry. And how to match up the prints before you sew the pieces together. She uses pins, lots of pins. But if you really want to make sure your prints line up you need to pin – pin – pin. 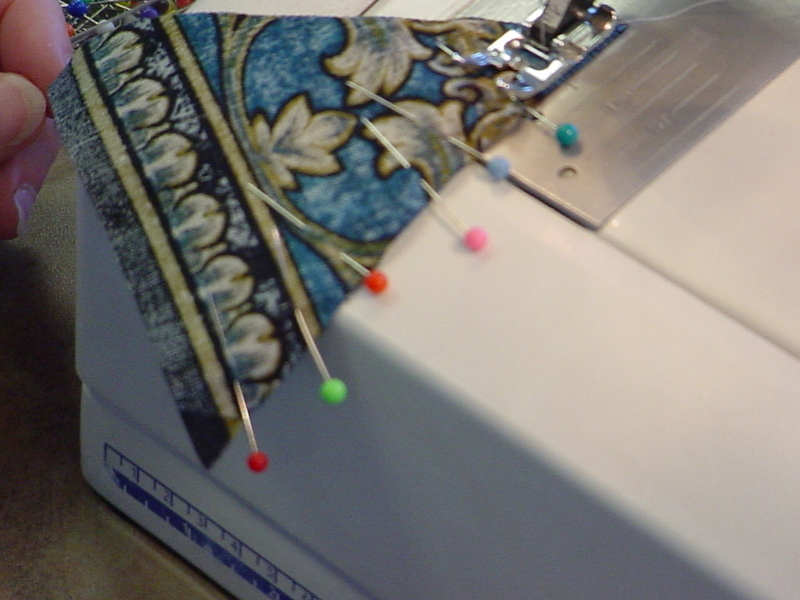 She also demonstrated how to pin the final seam together while matching the print and the center seams. This takes practice to get it right. Mine came out ok but next time I will do better. I am going to keep my eye out for some neat border prints. I’m also going to keep my eye out for more classes taught by Anne. Thanks for the great class Anne. Click Here for a slide show of more workshop photos. This entry was posted in Guild Activities, MVQ, Programs and tagged Anne Lainhart, Kaleidescopic purse. Sewing at the Kelly Library on Tuesday March 16 at 6:00 pm. We will be in the room that is directly in front of the entrance on the lower level. As of this morning Main Street by the Fire Station was closed. The easiest way to get to the library is exit 1 off of 93. Continue to the route 28 intersection and go straight across onto Veterans Memorial Parkway, pass Toys R Us on the right, police station on the left. Turn left onto Geremonty Drive where the Town Hall and High School are. The library is on the left at the corner of Geremonty and Main. Main Street is open from the library to the Methuen line and beyond to 495. Mystery Bus trip- still a few seats! Our upcoming mystery bus trip is a mere 12 days away now. Let’s all pray to the weather gods for good weather that day! I do have three more open seats so if you know of anyone else in the guild or not, who would like to join our fun filled day please let me know. Just a reminder to be at Westgate Plaza in Haverhill for an 8:00 am prompt departure so we get to our first shop on time. Please wait for me to get on the bus and share our secret destination with the bus driver and then I will give you the high sign it is ok to board. Bring your lunch as well as morning coffee etc. Any red, white or blue fabrics( does not have to be patriotic themed) and a spool of thread. Also an item for the bus basket for the penny raffle – it can be notion, fabric, thread or something off the chart but quilt related. Looking forward to the 13th. Tonight’s sewing session at the Kelly Library in Salem is cancelled. The next session at this location will be Tuesday, March 16 at 6:00 pm. Please join us then. Contact Carol Sullivan for more information.